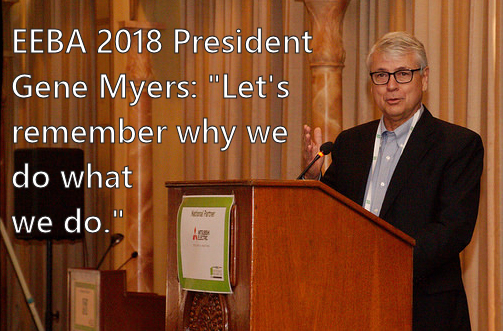 During his closing remarks at the recent High Performance Home Summit, exiting EEBA Board President, Gene Myers, reflects on the conference, the industry, and what we all must do to keep pushing forward. “So I decided to wing it. Ron's [Jones] talk to me was very provocative. We have to meet challenges. You want to know who is going to solve them? — the people in this room. Our big builders don’t do anything. Our big builders don’t take risks. Our big builders have no fire in the belly. They are harvesting the market. They harvest it when times are good and pull back when times are bad. And they have resiliency, because they have deep pockets and big capital. But we have creativity. We have drive. We have a saying at Thrive: When we see intractable problems, we need to deploy our secret weapon. And that is us. We live in a world where the worldwide engagement in our jobs is 16%. The United States and Canada lead the world with 29% of people fully engaged in their jobs. You want to know Thrive’s secret weapon? — 100% engagement. For every two hands we hire, we get a free brain. That is our secret weapon. We are a small fish in a very big pond. I have often thought that it’s a little like white-water rafting. The current is whatever’s happening — the economy, technology — and it’s going to go wherever it’s going to go. We are in that stream, and a skilled whitewater rafter knows how to navigate the obstacles and get into the right stream. That’s what fully engaged people can do, and that’s a powerful thing. We are challenged right now at Thrive with the reality that it costs more to build our houses. It costs more to build a better house. Is anyone really shocked by that? We have an affordability problem, and our challenge is how do we find a way to build our kind of house at prices people can afford. It is hard. But there is no one else who will do it. Who is better equipped than the people in this room to take that challenge, and to use our ingenuity, creativity and our commitment to wrestle these problems to the ground, whatever they may be, and make this world a better place? Ron is an environmentalist. You and I are environmentalists. We just happen to be dealing in the human environment. There is no higher calling, because our human environment means we need to leave the world a better place. We need to make our homebuyers thrive. That’s why we changed our name. We need to make our employees and co-workers thrive and prosper. We need to make sure everyone who touches any part of our kind of company walks away a better person. I go to conferences, and I see all the predictions about factory-built homes and panel plants. It might happen. But what I always come back to is: What can I do today? What can I do tomorrow with the cards I have been dealt to make the world better? It will take time to get to factory building as the predominant method for building in the United States, and I would have to tell you that it won’t happen in my career. So I guess I’ll just give up…No. No! Because we have today, and we have tomorrow. Another issue is the long game, and I will be honest with you, I think the industry is too distracted by the shiny new thing called the long game, to the exclusion of what do we do today and tomorrow to make the latter better than today. What’s the medium game? What’s the short game? For us, the short game is the full engagement of our people. For us, let’s just face reality and deal with it as it comes. Let’s not live in a dream world. Let’s not wish for how we want it to be. It is what it is: Let’s go do something about it. That’s why I love EEBA. That’s why I love you. Because that is what we, in this room, are all about. IBS will not change the world. The EEBA conference changes the world. IBS is about the status quo. NAHB — I’m a card-carrying member — their mission is to defend the status quo. Our mission is to change the world. So, I have a joke — it’s a bad joke, and all my people are rolling their eyes, because they have heard all of my stories way too many times. I used to be a Peace Corps volunteer. And the joke is that I joined the Peace Corps to save the world; it must have worked because we’re still here. After you get out of the Peace Corps, you sort of have to come down from that. But guess what — I didn’t change the world. And I’m not going to change the world in the way I thought I would when I was young. But I have this philosophy that our job is not to worry about that. That is above our pay grade. How about we just bloom where we are planted? How about I just build the best houses? How about I change the world for the customer? You saw and heard some anecdotes [in the PechaKucha session] yesterday about changing the world for a kid on an inhaler. That’s a good thing; that is an important thing. Thrive will never be big enough to take over the world, but we can take over the world for our customer by building the most important thing they will ever buy — the thing that will change their lives more than any other purchase. I am incredibly optimistic for us in this room. We have the spark, we have the drive, we have the mission, and we care. We also have the technology. We just need the people. We need the culture in our companies to be “This is what we do.” We don’t cower in the face of the problem. We don’t wring our hands over things we cannot really change. I have come to think that living in the present is way better than living in the past or the future. The present is the only time we have to make a difference. I urge you to keep the faith. I urge you — in the face of rising interest rates and labor challenges and all the other stuff we deal with on a daily basis — to remember why we do what we do and that it’s a worthy thing we do, so it is worth doing well and worth doing right. We make a permanent mark on the landscape. We leave behind us neighborhoods and homes that will be there for 100 years or more. So it is very important that we do it well. That is what you guys are about. My hat is off to you for being present on this third and final day. My hat’s off to you for paying the expensive plane fare to get here. We have heard complaints that, maybe, our tuition [for the Summit] is a little high. This is what it costs, so thank you for paying it. We ask you to be with us again next year in Denver. Bring a friend. Bring a whole department. Bring your company. There is something infectious about just being with you and with us that, by the time everyone goes home, will make anyone you bring a better builder and a better person.